Financial penalties imposed on financial institutions by government agencies totaled $21.8 billion in the first quarter of 2013, an amount representing more than two-thirds of the total financial penalties imposed in all of 2012, according to data released today by the Committee on Capital Markets Regulation. The first quarter data shows a continuing, rising trend in total public financial penalties imposed on financial institutions since 2007. Public financial penalties include public class action settlements that arise from class action lawsuits brought by the government (e.g., state attorneys general) and regulatory penalties that follow enforcement actions by regulatory agencies including the Securities and Exchange Commission (SEC), the Commodity Futures Trading Commission (CFTC), and others. 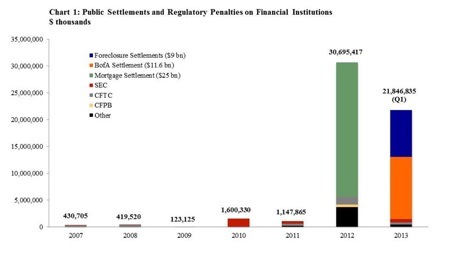 Of the $21.8 billion in financial penalties imposed in the first quarter of the year, $20.7 billion involved public class action settlements, including over $9 billion in settlements regarding alleged mortgage foreclosure wrongdoing and an $11.6 billion settlement between Bank of America and Fannie Mae over claims related to soured mortgage-backed investments. Regulatory penalties amounted to approximately $1.1 billion in the quarter, with $475 million of that total coming from a fine imposed on RBS by the CFTC and Department of Justice over the LIBOR rate-fixing scandal.